What is trademark actually mean? A trademark is a crucial identification name, logo or brand name for your products or services, which gives you a unique identification anywhere in the world. Trademark not necessarily a logo, an it can be a name, brand name, product or something which want to have complete rights on. Trademark is a unique expressive term, image or logo, which shows an iconic representation of brand products and services, the specific trademark of each brand separates’ it from other competitors in the market. Anyone can apply for the trademark registration in India who claiming the ownership of the products, service or goods, which he/her/company wants to use under that trademark. You must agree for using the trademark while filing the application for registration. Do we need to provide any Proof of use? No, using the trademark on your services, products or goods before registering it is not mandatory. we are register from Government OF India as Trademark Attorney . How do I know my trademark available or not? For every trademark registration application there will be availability check which takes time for confirming the availability, we AStar Group Registration service providers can help you to check the availability of the trademark by going through the large public databases to check anyone else registered the trademark before. Is trademark registration is mandatory to use it? No, you can use the un-registered trademark for works but you can’t use a registered trademark for your works. It is not mandatory to register the trademark for business, goods or products but it is advised to register to eliminate/avoid future issues. What can be registered under trademark? Can filing an application confirm trademark allotted for applicant? No, the govt will accept your application but after that there involves steps like search for trademark, eligibility of applicant, mistakes in application forms, any unlawful and other things. There are chance to reject your application for trademark registration on few grounds like relative grounds, absolute grounds, deceiving trademarks, confusing and scandalous matter. What if the trademark not available or someone else registered? No compelling reason to stress. In the event that your trademark image or name is taken, you can set up a Logo Composite Mark by consolidating your logo and your name, and apply as one. This is a typical procedure used to apply for a trademark, regardless of whether the exchange name itself has been taken. Is this process is simple as it sound? No, it involves several crucial steps from filing an application, documentation, filing statements and few other important steps. Messing up with anyone these steps will trouble the entire application procedure, more over its time waste because of the mistakes. It is advised to consult with trademark registration service provider. Where do I have to file an application in India? You can file the application online and offline, to file an online or offline application just contact us, we are professional trademark registration service providers in india. However, you file an application in intellectual property offices located in Chennai, Mumbai, Kolkata, Ahmadabad and Delhi depending on the jurisdiction of your (owner) area. In the event of an enlisted trademark, an activity for encroachment lies where the distressed can look for common and criminal reliefs. Other such as legal protection, unique identity are top benefits. What are needs to submit? There is a list of documents you need to submit for filing an application; it depends on nature of the registration such as individual or partnership kind of ownership. Along with all the basic documents such name, address, nationality and firm name, you need to submit some other crucial documents which need to be evaluated based on trademark. Instead you can give us an authorisation letter to file an application on behalf of you. We will guide completely and after careful evaluation will collect the necessary documentation. How much time will it take to get trademark? The trademark registration application process is done right away. It should be possible within a couple of hours of you giving us your Authorization Letter. The Government, after we make the application, takes 18 months to two years, to affirm the enlistment and give you the affirmed Registration Certificate for your trademark. You would then be able to utilize the ® image by your name. Constructive notice of ownership of the Trademark . ™ and ® is Prestige of your Brand and your Company. Its ownership and get exclusive rights over your trademark. You can sale your Trademark ™ and ® and/or give license to other company to use your Trademark and get Royalty for the same. The exclusive right to use the registered mark in commerce in connection with the goods or services specified in the registration. Establish the Goodwill and incontestability of rights in the registered mark . No one can make a copy of your trademark; if someone copy then you can take legal action against them and ask for damages..
Sue for counterfeiting of the registered mark and to obtain both civil and criminal penalties against counterfeiters . Similar advantages can be obtained from registering a trademark in most other countries of the world. In some countries, a registration is a requirement for any enforcement activities. Since the advantages necessarily vary from country to country. A ™ is usually used to indicate an unregistered trademark. It is an informal notification that there is a public claim as a trademark. An SM represents an unregistered service mark. It is also an informal notification that there is a public claim as a service mark. The ® (commonly pronounced “R-in-a-circle” or “Circle-R”) is a warning notice to advise the public that the mark is registered and their use provides legal benefits. This notice can be used only with registered marks. Use of a ® with any unregistered trademark may result in claims of fraud. Several other countries also use the ® symbol to indicate that a trademark or service mark is registered in their respective systems. Time taken for application for registration is 7 working days from the time you appoint us for the work. Time taken for certificate of Registration of trademark is about 18 to 30 months. A reply has to be made for the same within 1 month and 15 days respectively.. In case they still are unsatisfied with the reply, they call for hearing upon which it is decided whether the case is fit for advertisement or not..
Once the mark is advertised in trademark journal, there is 4 months time for others to object the mark.. If no objection is received in 4 months time, the Registrar issues the certificate of registration..
For registering trademarks designed by organizations and firms situated in the whole Jaipur, there is no any legislature claimed tm enrollment office in jaipur. In this manner, all these licensed innovation of substances arranged in Jaipur, are enrolled and ensured by the zonal trademark office settled in Ahmedabad at Ashram Road. 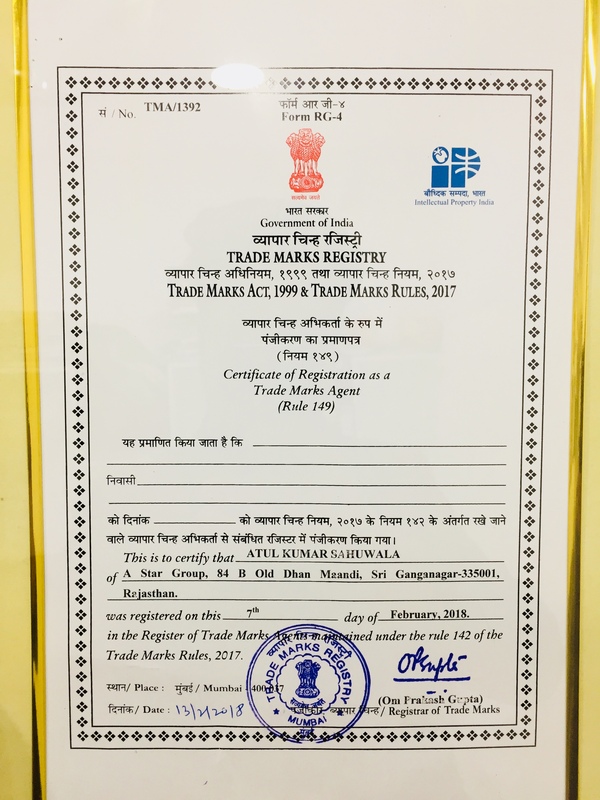 Our own very much experienced and all around resourced secretly oversaw trademark office in jaipur, helps these elements of Jaipur in making all procedures with the trademark registration help from us in regards to culminate enlistment, control, and insurance of their individual trademarks and administration marks at the national level. we give the total scope of five star, dependable and sparing legitimate administrations to individuals, organizations, and firms entrenched in all over this biggest city and grand capital of Rajasthan, naturally including magnificent and lively lawful administrations for trademark enlistments. Today, a standout amongst the most presumed and all inclusive prominent law offices of India and the entire world, is our own all around associated legitimate association, with nice and dependable lawful administrations in every aspect of the law, conveyed in nations worldwide by its very much educated and smooth lawful experts. Today, the primary and most huge monetary fields of this driving business city of Rajasthan are connected with gold, precious stone, and stone adornments; marble and rock sandstones; farming merchandise and items; materials; tourism and friendliness; ferrous and non-ferrous castings; electrical supplies; bond; PVC items; electronic gadgets; different conventional and current handiworks; light to overwhelming steel creation; data innovation; chemicals; business outsourcing; and different administrations. The government trademark law of India spoke to by the new Trade Marks Act of 1999 is only utilized for the household enlistments of trademarks in these fields; and every single abroad enrollment of these are stringently represented under TRIPS Agreement, Berne Convention, Madrid Protocol, and the European Community Trademark. In the Indian Union, the brand (trademark) rights emerge from use as a trademark. There are numerous advantages to having a brand enrolled with the India. Exchange check enlistment is presumably the most critical piece of an organization’s insurance of licensed innovation. Without trademark enrollment, an organization depends entirely on the normal laws in the land territory in which it utilizes the trademark. All the more significantly, without enlistment, a latecomer may enroll a stamp indistinguishable or like the trademark of the organization. This account by another client may obstruct the extension of the organization’s utilization of its stamp in different territories or may piece ensuing endeavor of the organization to enroll its trademark. This is certainly an intense pill to swallow for the organization could have stayed away from these issues with early enrollment. On the off chance that the organization had recorded a message before the other client, the RTM declined to another or confusingly comparable imprints. What’s more, the organization would at present have better rights than the latecomer, and would not be hindered in its extension designs. An engraving on the enlist of trademarks might be the reason for the seizure of fake or encroaching products and Contact Signs and Marks for enrolling your trademark registration in Kerala, India. Trademark Registration Services assumes an imperative part in the present business technique. Envision a circumstance where your Brand name/exchange name/name/subtitle or motto being duplicated by somebody or comparative checks is embraced for comparative products and enterprises for his or her business advantage purposely or accidentally. Correspondingly envision a circumstance where your exchange name/mark name/exchange stamp/logo/name/trademark/phonetically or outwardly comparative check is replicated and utilized by your rival. Promote him requesting that you quit utilizing your trademark by documenting a Trademark application before you and by acquiring a brief or changeless directive from District Court or High Court saying that your stamp is indistinguishable or like his/her check. Another circumstance is the place you need to pay or eminence for utilizing Trademark for your business to your rival. AStar Group will furnish you with the best administrations in Trademark Registration Mumbai. It might be noticed that it isn’t sufficient that you have enlisted your exchange name under the Companies Act. Enrollment of your firm or organization is for making your organization a legitimate substance and name look is led just among the organizations or organizations officially enlisted as LLP or Pvt. Ltd or as Limited Liability Company. There is a probability that a Proprietorship concern or a Partnership concern will utilize it as there is no bar to such utilize. It would be hazardous, troublesome and costly for you to demonstrate that you were the earlier client. Along these lines, it is constantly better to enroll your imprints at the soonest ie. Indeed, even while it is proposed to be utilized as enrollment costs are sensible and moderate to all. Assist in case of an exchange of responsibility for organization or permitting of a brand/exchange name or amid coordinated effort or Joint Venture the significance of enlistment is high. Enrolled exchange name or brand will give the colleagues/JV accomplices with the certainty to put resources into a brand or business. Not having even ensured your trademark could influence your leave/securing. So you can escape from these impending risks by distinguishing, securing, overseeing and authorizing your licensed innovation administration at the initiation of business itself. Like some other physical property or land, your licensed innovation/impalpable resources should be secured and made preparations for infringement by legitimately guarding it. TradeMark Registration Jaiupr, TradeMark Registration services Jaipur, TradeMark Registration Consultants in Jaipur Register your Trademark (TM) Application online in Delhi NCR, Mumbai, Bangalore Rs 999.
trademark registration in kolkata, trademark registration in delhi,trademark registration mumbai, trademark registration in kerala,trademark registration in hyderabad,trademark registration application,trademark registration in chennai,trademark registration number,trademark registration in bangalore,trademark registration check,documents required for trademark registration,benefits of trademark registration, Trademark (TM) Registration Service, Trademark Registration Process, Trademark Registration Cost, Best Trademark Registration Service Provider, Trademark Registration Fees India, Trademark Registration Search.